There’s something wrong with the rain these days. For many regions of the globe, when the rain does fall, it more and more often comes with an abnormally fierce intensity. This increasing severity of heavy rainfall events is just one aspect of human-forced climate change through fossil fuel burning. For as the Earth warms, both the rate of evaporation and precipitation increases. And as atmospheric moisture loading and convection increase coordinate with rising temperatures, so do the potential peak intensities of the most powerful storms. This past week, in Sierra Leone — already one of the wettest regions of the globe at this time of year — a very heavy rainfall event generated a severe mudslide that ripped a huge swath of devastation through Freetown. 3,000 people were immediately rendered homeless by the great rush of mud, rock, and soil. But more tragically in excess of 300 people are feared dead with 600 still missing. This single event represents the deadliest natural disaster on record for Sierra Leone — which also suffered a flood that killed 103 people in 2009. According to news reports, the region in which this disaster occurred has experienced 20 inches more rain than usual over the 30 day period from July 15 through August 15. A total amount of rainfall in a single month period that’s now in the range of 50 inches. Clearly, the surrounding lands could not maintain integrity under the force of such a prolonged deluge. And unfortunately one of the succumbing hillsides let loose into a valley settlement. The heaviest downpours in many parts of the globe have become heavier in recent decades, a trend attributed to human-produced climate change and expected to continue. A study led by Christopher Taylor (UK Centre for Ecology and Hydrology), published this spring in the journal Nature, finds that the Sahel’s most intense mesoscale convective systems (organized clusters of thunderstorms) have tripled in frequency since 1982. The recovery of Sahel rainfall since the 1980s only explains a small part of this trend, according to the study authors. They argue that Saharan warming is helping to intensify convection within the MCSs through increased wind shear and changes to the Saharan air layer. “The meridional gradient is projected to strengthen throughout the twenty-first century, suggesting that the Sahel will experience particularly marked increases in extreme rain,” the study concludes. Severe rains also on August 14th unleashed a mudslide in Pradesh India that knocked two buses off a cliff — resulting in the tragic loss of 46 lives. The resulting landslide also injured 5 other passengers even as it buried numerous homes along its path. Across the Bay of Bengal in Nepal flooding and landslides resulted in the loss of 62 lives as 30 districts reported severe conditions. There, rains displaced 1,500 families, destroyed 305 homes, and damaged more than 15,000 other dwellings. Dozens of Nepali roads have been blocked, a school has collapsed, and an airport has been forced to close as severe storms inundated the region. In the Indian state of Assam, 84 people have lost their lives due to a massive flood that has now affected 2 million people across 29 districts. 2,734 villages have flooded and 183,584 people have been forced to relocate to one of 700 refugee camps. Meanwhile, across the state, some 3,830 water rescues have occurred. Dozens of roads and bridges have been washed out as rivers rise from moderate to unprecedented flood stages. Finally, in Bangladesh, record rainfall has pushed rivers to some of the highest levels ever recorded. The result has been the forced displacement of 368,000 people to 970 temporary shelters as 1.3 million are afflicted by flooding. Tragically, 27 Bangladeshis have also lost their lives due to the extreme flooding. Rainfall rates of up to ten inches per day are contributing to the severe flooding even as water from floods further upstream in India and Nepal are flowing into Bangladesh river systems. Overall, these various events may appear to occur separately. However, they are all associated with a very severe Equatorial rain pattern developing from Africa through Southeast Asia and stretching into the Atlantic inter-tropical-convergence zone during 2017. The apparently increased thunderstorm activity is now impacting everything from the intensity of monsoonal rains over Southeast Asia, the severity of storms in the Sahel of Africa, and the early formation of tropical cyclones off Cape Verde during August. These heavy rainfall features are arguably linked to the climate-change based intensification of the hydrological cycle and, particularly, to the increasing intensity of Equatorial thunderstorms. The overall climate and weather trend for the larger region should thus be noted and these various related events should not be viewed in isolation. Typically, extreme events like these occur when the atmospheric pattern becomes stationary. Heavy rain is not unusual in the tropics. Sustained heavy rain over time is the culprit here, I’d say. We have weird storms in Alabama nowadays. These will hover over one area, while morphing in shape. In this way, a very small storm can cause severe flooding. Interesting. Not seeing much of those in Vermont. We’re getting “training” storms that come in a series extending sometimes over hundreds of miles and just flow past. How hard you get hit depends on exactly where and how steady the track is. Oh, and I should add, we’re also seeing more intensity. Storms where it really comes down in buckets, though still usually not for too long. That’s good, because the topography here is very conducive to flash flooding. A contributor is the temperature rise causing the atmosphere to hold (then emit) more moisture. Thus we are witnessing more “rain bombs”. If these events occurred in isolation, we could consider them a one-off. But we have a growing trend of increasing thunderstorm intensity in the tropics. Furthermore, 1 C warming has amped up the hydrological cycle by about 8 percent. That’s 8 percent more intense evaporation and 8 percent more intense precipitation. Of course, the atmosphere is not even, and this extra energy isn’t evenly distributed. The equatorial patterns feeding the monsoon and the ITCZ are basically precipitation amplifiers. So you have now loaded the climate dice in these regions for more intense events. More lightening strikes is also a predicted result of global warming. It all adds into the toxic mix. I’ve heard a variety of figures for how much more water vapor remains in the atmosphere on average for each degree C the planet warms. I heard 3-4 % on the radio yesterday, but now that I’m thinking of it, that was probably for every degree F. But it seems to me that I have usually heard 6 or 7 %. If robert anyone has a handy reference/link or other source of info on this topic, it would much appreciated. Net rate of increase for evaporation and precipitation is 7-8 percent per degree C.
To paraphrase Lily Tomlin, no matter how depressed about GW I get, I can’t keep up. To pull the context of your previous post regarding no El Nino, yet a global high temperature, and dovetail it with this post. I wonder what will happen if we see a repeat of the 97 super El Nino in this current situation. Higher atmospheric temps holding more moisture, but with a temp cranked up further by a significant El Nino, causing further moisture loading. That is tough to fathom, as 97 was really bad for those of us who were in it’s path. To super charge that further would be quite terrifying. If you’re talking about impacts to the U.S. West Coast, it’s tough to say. If you got a 1997/1998 type gradient and storm track in the present atmosphere, then the conditions would likely be considerably more extreme. The present El Nino tried, but ran into one hell of a blocking pattern that finally relented this past winter, which was rather wet if not as stormy as 1997/1998. What did occur also was pushed northward towards / into BC. It also had the blob steering things as well. We were in the traditional bulls eye zone for the last one, no rain of any note. Yup, tough to estimate where, when, what. But another doozy anywhere along the coast would make a mess. Laguna Nigel would again look like some sort of Cristo art piece with all of the blue tarps on the hillsides. An incomplete picture of the ancient atmosphere was recently given better resolution with ice cores 2.7 million years old. Nice to see, Greg. Love the props for renewable energy. Been supporting it here for years now. And it definitely feels like I’m being inconvenient. Thanks again for the hat tip RS. In light of the recent purge of far left/right web sites by the powers that be, I’m wondering when they will see this blog as to far from the centre? My apologies if this has been posted by someone else. We thought FL was bad enough. “Climate language The US Department of Agriculture (USDA) has come under fire for a series of e-mails directing employees at its Natural Resources Conservation Service (NRCS) to avoid referring to global warming when talking about their work. News reports on 7 August revealed that Bianca Moebius-Clune, director of soil health at the service, had sent an e-mail in February to staff telling them to avoid the term ‘climate change’ and instead talk about ‘weather extremes’. The message also blacklisted the phrases ‘reduce greenhouse gases’ and ‘sequester carbon’. The USDA said in an e-mailed statement that the NRCS “has not received direction from USDA or the Administration to modify its communications on climate change or any other topic”. Canada wildfire smoke image for today. Great Lakes for scale. Wow. Fires to the left and right in Canada now. Things are no better in Siberia either, check out the sat pic from the Deep Space Climate Observatory 1.5 million kilometres away. The thinning of the forests is most acute in northern Siberia where fires can ravage plant life and shallow roots, making it impossible for trees to regrow for centuries – a process known as ‘green desertification’. ‘Already seven million hectares have burned, that’s more than average,’ said Grigory Kuksin, in charge of the wildfire prevention programme at Greenpeace Russia. 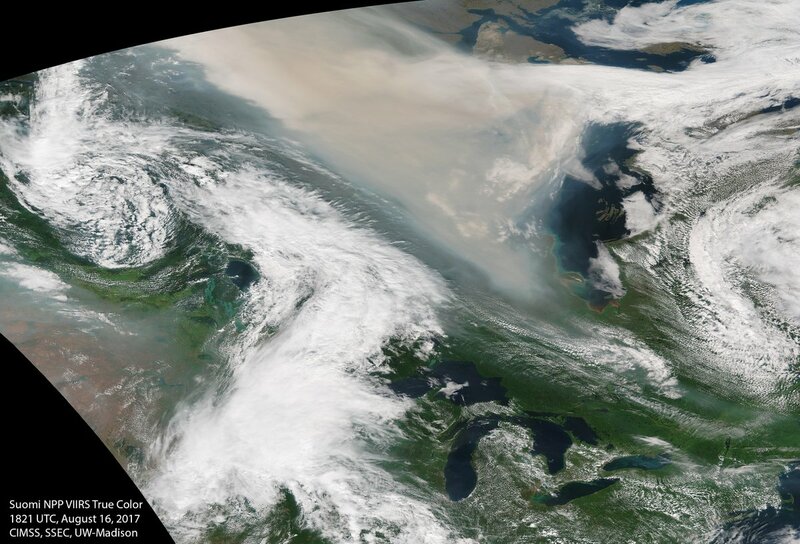 These pictures of massive smoke plumes put paid to any notion that warming is to the advantage of northern countries like Canada and Russia. In Canada’s case, we may get a short-term bump in agriculture for a generation, or even two generations, but in the long term we will have the challenge of growing crops on rocky soil recently vacated by burnt forests. And of course, we will have to deal with the forest fires themselves, melting permafrost, damaged infrastructure, as well as the storm and flood damage. There is no safe country on the planet with BAU fossil fuel usage. I am glad to be able to comment in a troll-free environment, and so avoid the farcical arguments that “warming will be good for Canada” that I see on MSM sites. A town a bit west of us just had nine plus inches in just a few hours. That was estimated to be a 500 – 1000 year event. Meanwhile, this is the one year anniversary of the flooding tragedy in NOLA. The Australian Government is wanting to create more coal fired plants. It would appear a number of other countries do as well. The idea is being sold through using such terms as “advanced coal-fired plants”, “hypercritical”, “supercritical”, and “HELE” … high-efficiency low-emissions. The plants are still more expensive than non-hele coal-fired plants, some pollutants are dealt with; but, most CO2 is still voided into the atmosphere. A 17% reduction of CO2 over older coal plants is not good enough. Well, looks like they’re still more expensive than renewables. Looks like this is a very tough sell. From my point of view, any new coal plant built needs to be 100 percent carbon capture for me not to wholly object to the darn things. Of course, I still have some problem with CCS coal due to water and other issues. But this new sales drive appears to be yet yet one more harmful drive for a terrible power source..